Incidence • It's almost impossible to say how many young people are self-harming. 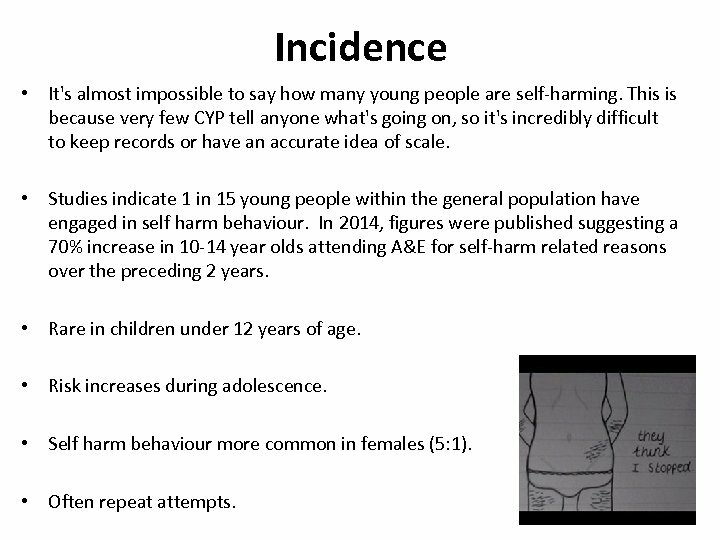 This is because very few CYP tell anyone what's going on, so it's incredibly difficult to keep records or have an accurate idea of scale. 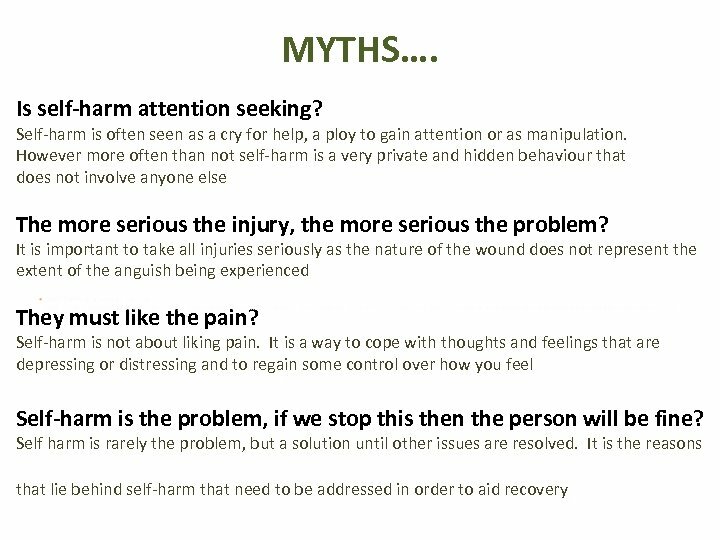 • Studies indicate 1 in 15 young people within the general population have engaged in self harm behaviour. 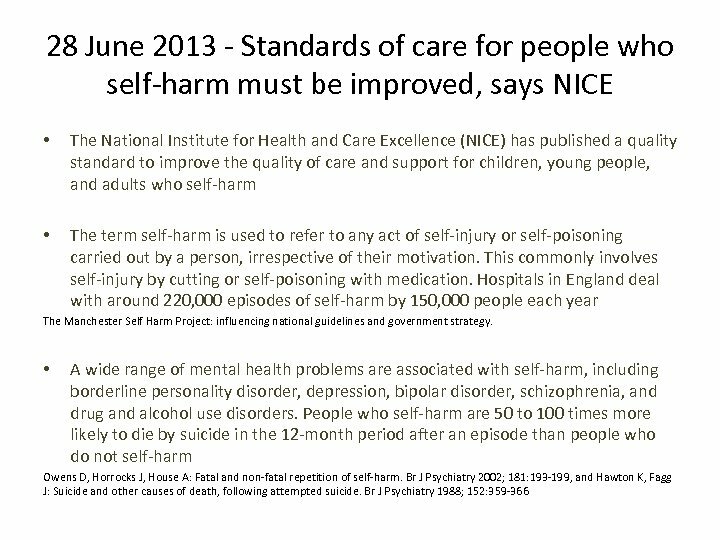 In 2014, figures were published suggesting a 70% increase in 10 -14 year olds attending A&E for self-harm related reasons over the preceding 2 years. • Rare in children under 12 years of age. • Risk increases during adolescence. 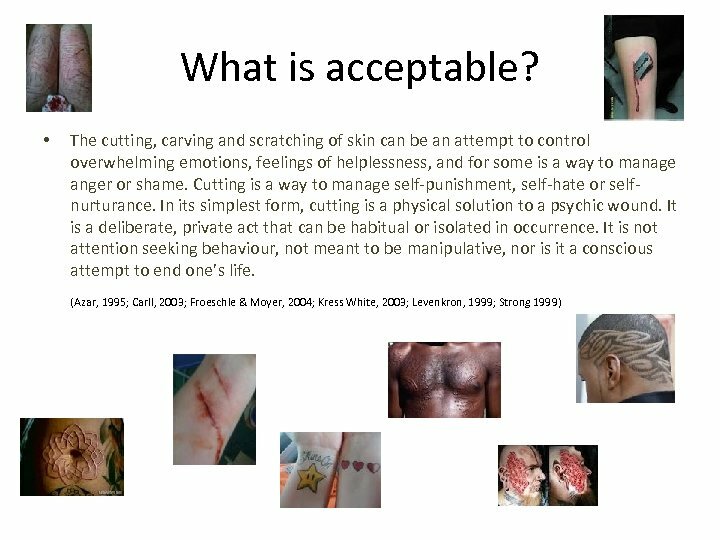 • Self harm behaviour more common in females (5: 1). • Often repeat attempts. 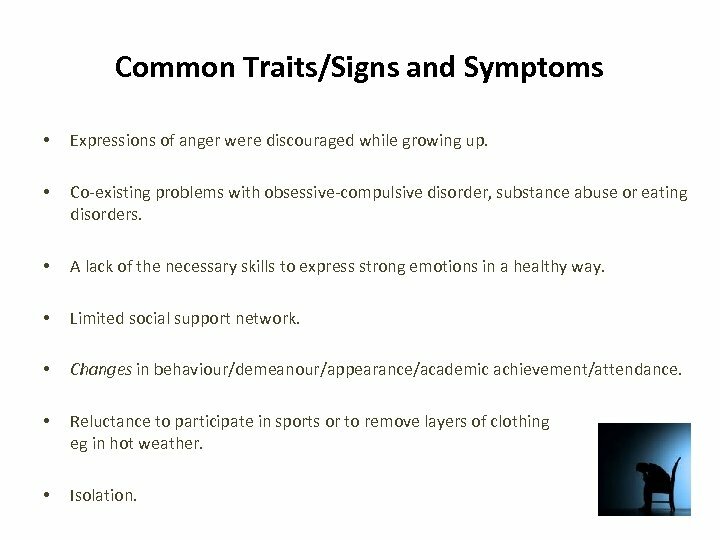 Common Traits/Signs and Symptoms • Expressions of anger were discouraged while growing up. 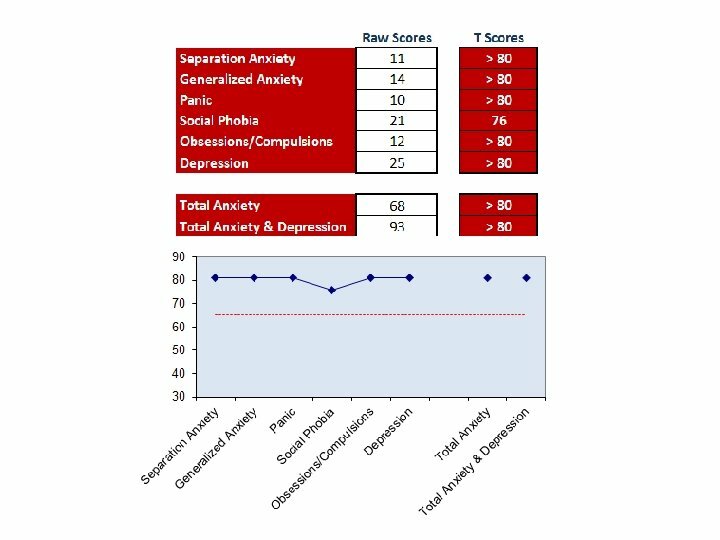 • Co-existing problems with obsessive-compulsive disorder, substance abuse or eating disorders. 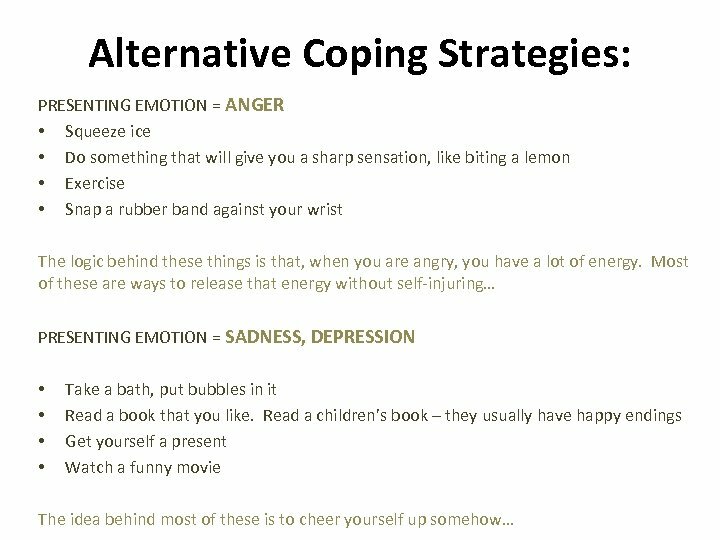 • A lack of the necessary skills to express strong emotions in a healthy way. • Limited social support network. • Changes in behaviour/demeanour/appearance/academic achievement/attendance. • Reluctance to participate in sports or to remove layers of clothing eg in hot weather. • Isolation. 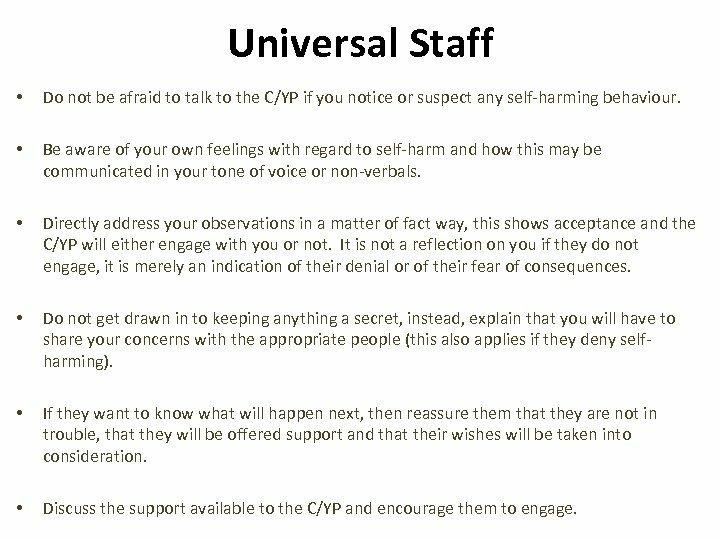 Universal Staff • Do not be afraid to talk to the C/YP if you notice or suspect any self-harming behaviour. 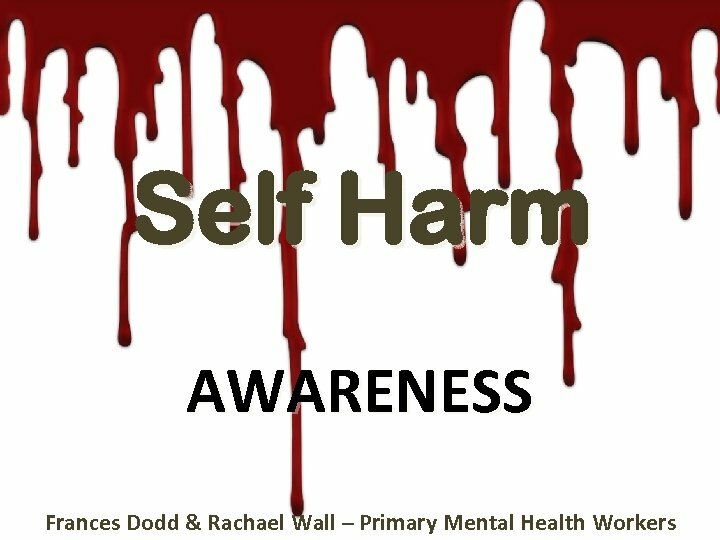 • Be aware of your own feelings with regard to self-harm and how this may be communicated in your tone of voice or non-verbals. 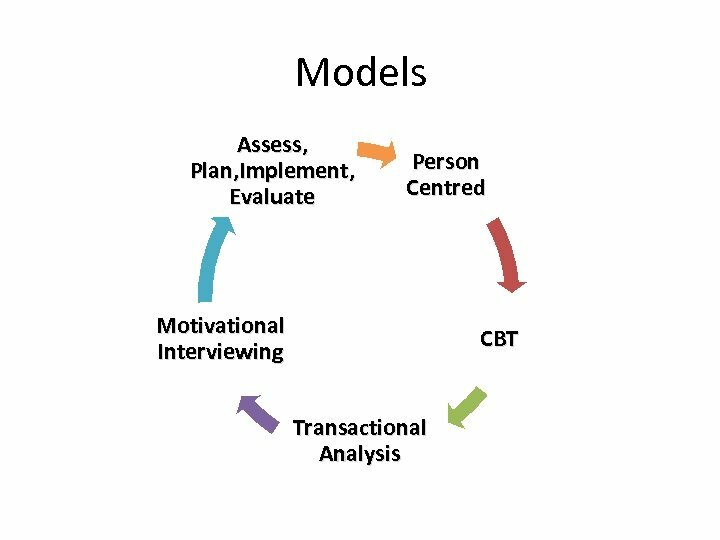 • Directly address your observations in a matter of fact way, this shows acceptance and the C/YP will either engage with you or not. It is not a reflection on you if they do not engage, it is merely an indication of their denial or of their fear of consequences. • Do not get drawn in to keeping anything a secret, instead, explain that you will have to share your concerns with the appropriate people (this also applies if they deny selfharming). • If they want to know what will happen next, then reassure them that they are not in trouble, that they will be offered support and that their wishes will be taken into consideration. 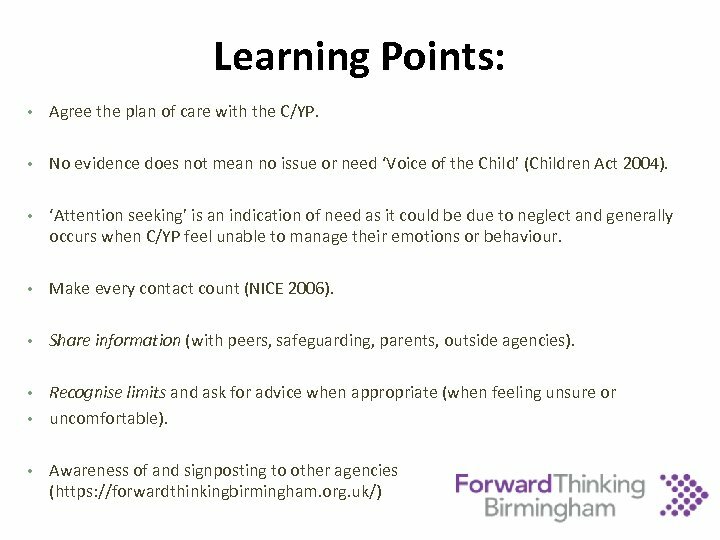 • Discuss the support available to the C/YP and encourage them to engage. D O C U M E N T S U P E R V I S I O N How to help if working 1: 1? • Acknowledge there is a problem. 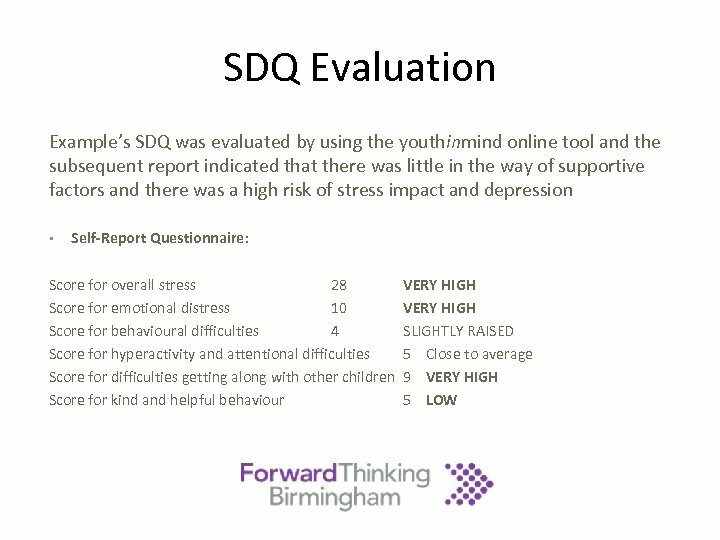 The young person is probably hurting on the inside and may need professional help to stop their behaviour. • Accept this is not about them being a bad person. . . This is about recognising that a behaviour that has previously helped them to handle their feelings has become a problem. • Either be, or facilitate the finding of, one person they trust to help. This could be a friend, teacher, counsellor, or relative. Encourage the sharing of this issue in a safe environment. How to help if working 1: 1? 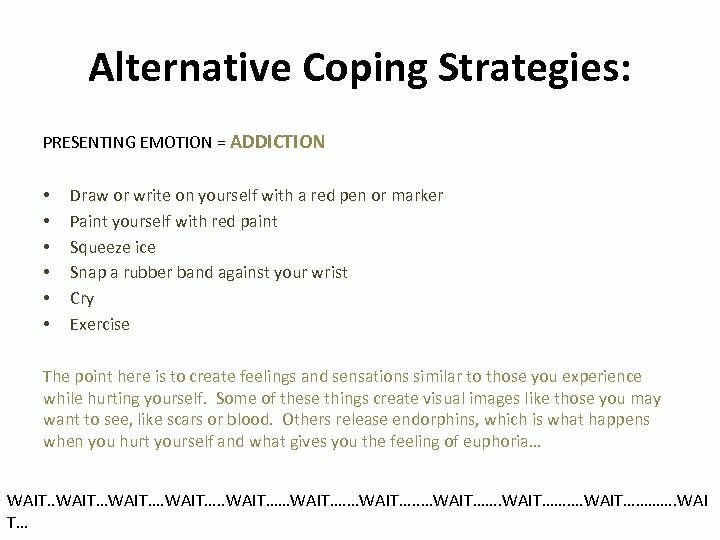 • If there is time and they wish to engage, try to help them identify what “triggers” the self-harming behaviour…then encourage the development of ways to either avoid or address those triggers. 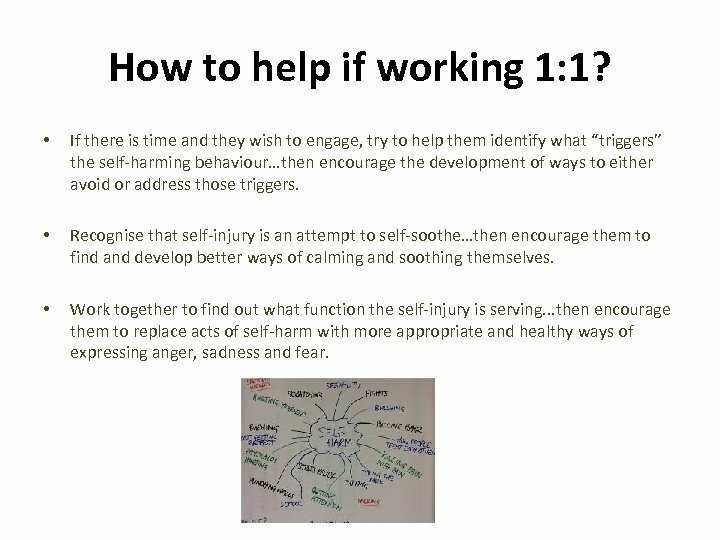 • Recognise that self-injury is an attempt to self-soothe…then encourage them to find and develop better ways of calming and soothing themselves. 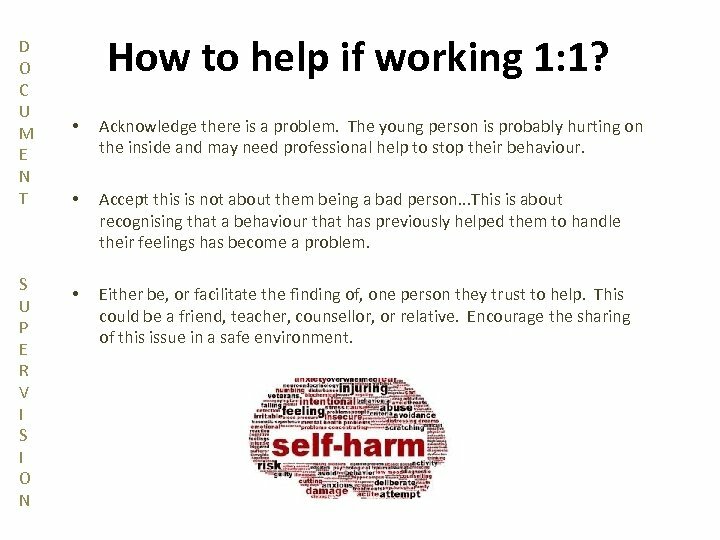 • Work together to find out what function the self-injury is serving. 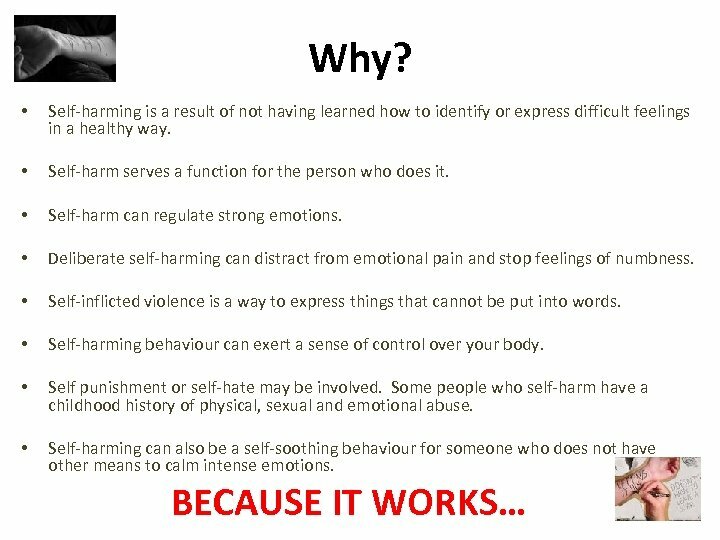 . . then encourage them to replace acts of self-harm with more appropriate and healthy ways of expressing anger, sadness and fear. 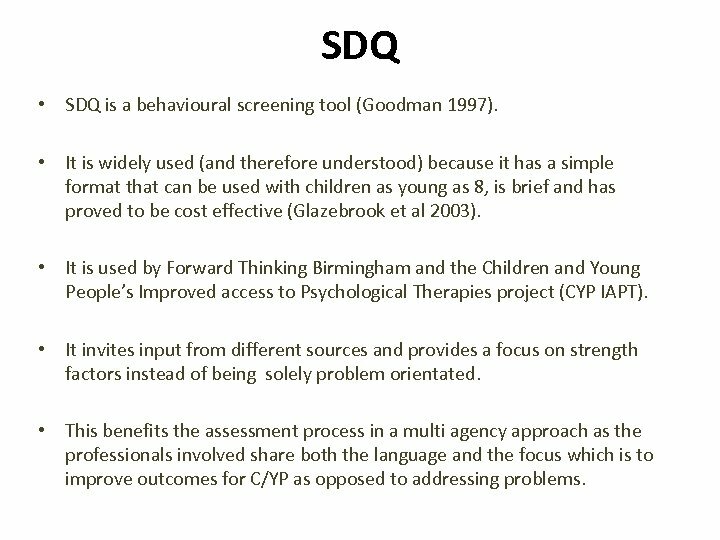 SDQ • SDQ is a behavioural screening tool (Goodman 1997). • It is widely used (and therefore understood) because it has a simple format that can be used with children as young as 8, is brief and has proved to be cost effective (Glazebrook et al 2003). 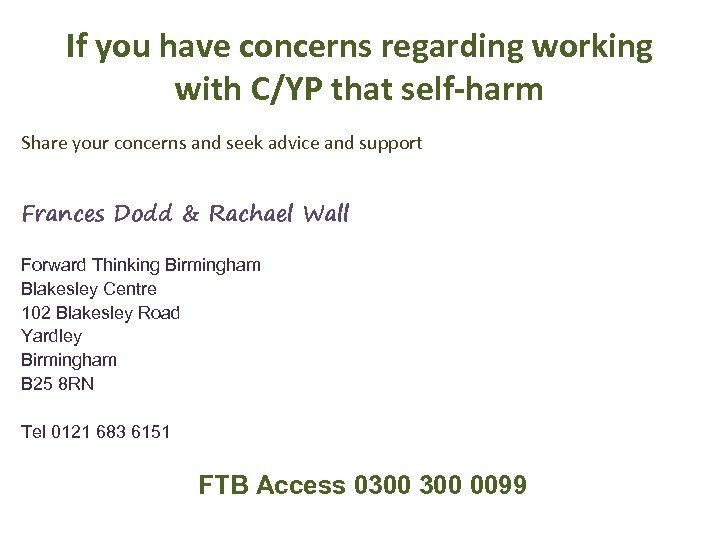 • It is used by Forward Thinking Birmingham and the Children and Young People’s Improved access to Psychological Therapies project (CYP IAPT). • It invites input from different sources and provides a focus on strength factors instead of being solely problem orientated. 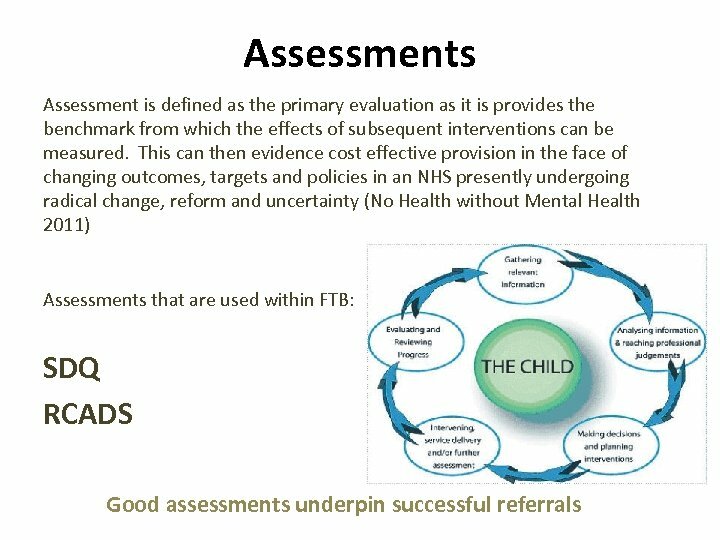 • This benefits the assessment process in a multi agency approach as the professionals involved share both the language and the focus which is to improve outcomes for C/YP as opposed to addressing problems. 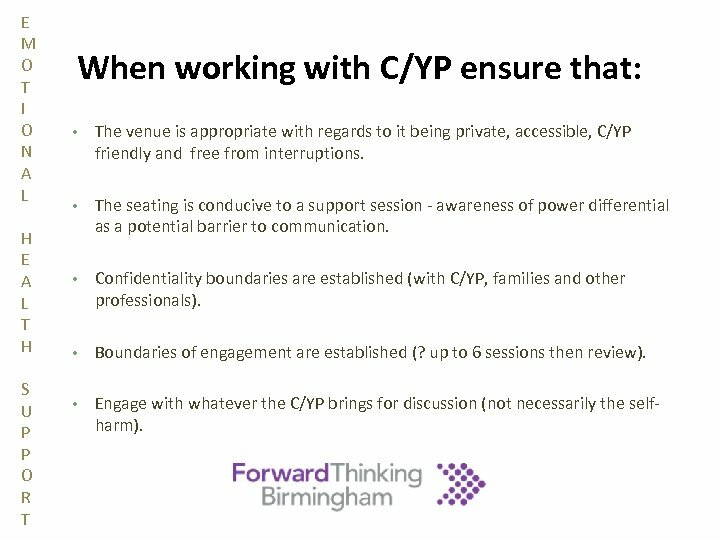 E M O T I O N A L H E A L T H S U P P O R T When working with C/YP ensure that: • The venue is appropriate with regards to it being private, accessible, C/YP friendly and free from interruptions. • The seating is conducive to a support session - awareness of power differential as a potential barrier to communication. • Confidentiality boundaries are established (with C/YP, families and other professionals). • Boundaries of engagement are established (? up to 6 sessions then review). 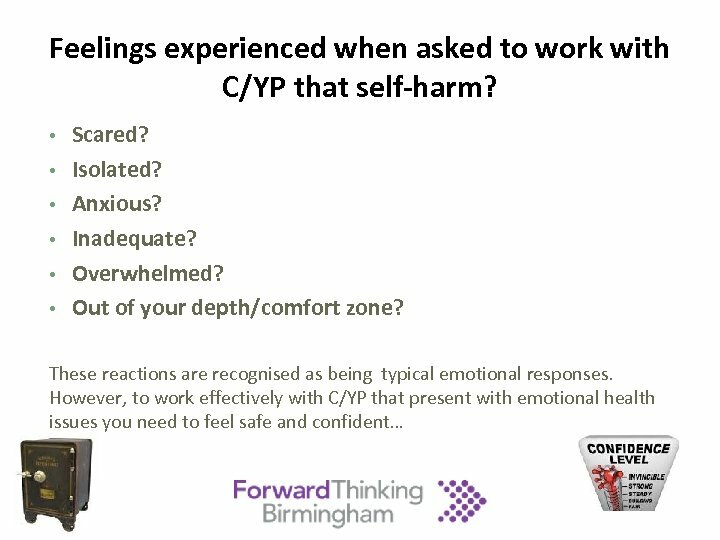 • Engage with whatever the C/YP brings for discussion (not necessarily the selfharm). 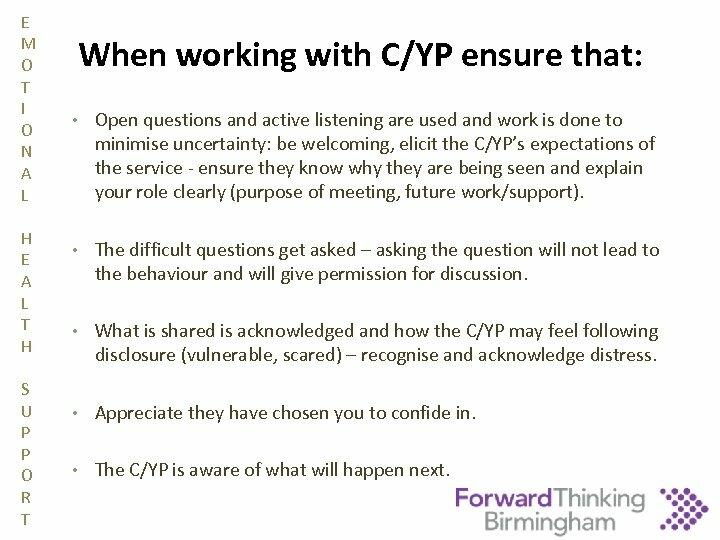 E M O T I O N A L H E A L T H S U P P O R T When working with C/YP ensure that: • Open questions and active listening are used and work is done to minimise uncertainty: be welcoming, elicit the C/YP’s expectations of the service - ensure they know why they are being seen and explain your role clearly (purpose of meeting, future work/support). 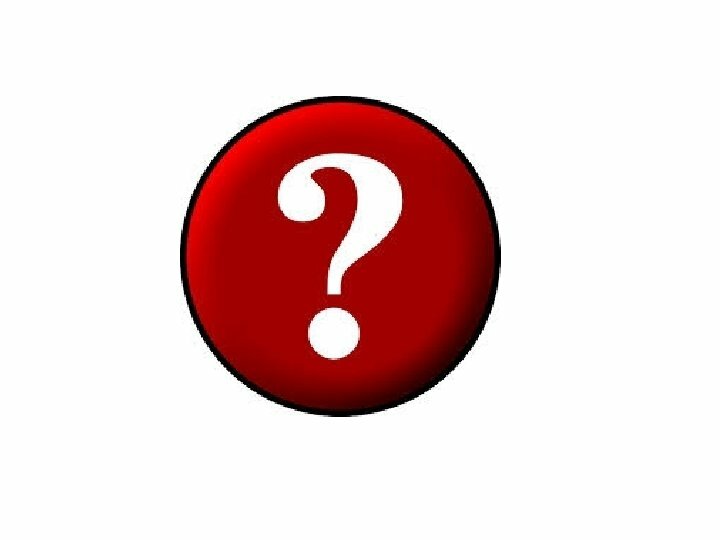 • The difficult questions get asked – asking the question will not lead to the behaviour and will give permission for discussion. 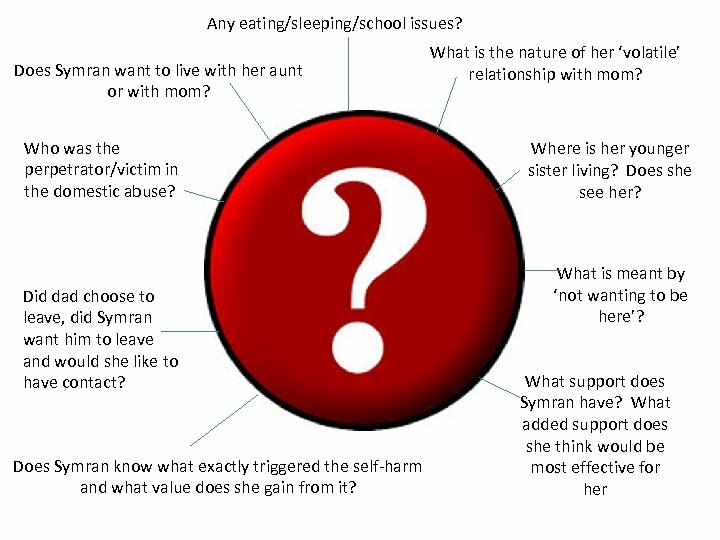 • What is shared is acknowledged and how the C/YP may feel following disclosure (vulnerable, scared) – recognise and acknowledge distress. • Appreciate they have chosen you to confide in. • The C/YP is aware of what will happen next. 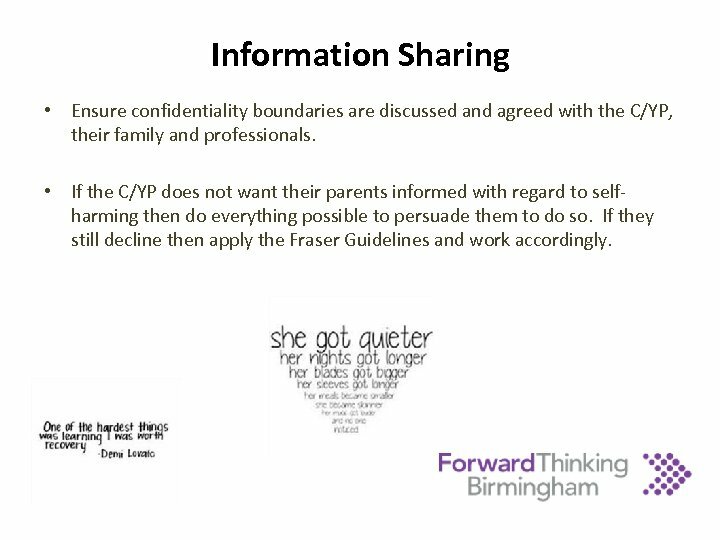 Information Sharing • Ensure confidentiality boundaries are discussed and agreed with the C/YP, their family and professionals. 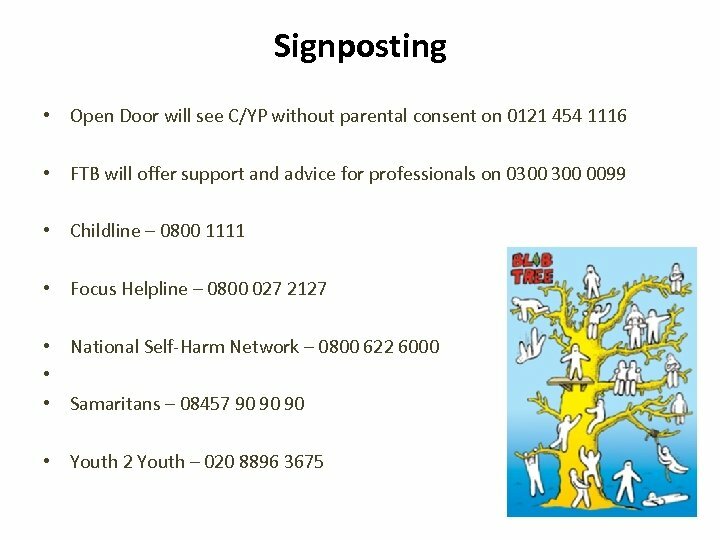 • If the C/YP does not want their parents informed with regard to selfharming then do everything possible to persuade them to do so. If they still decline then apply the Fraser Guidelines and work accordingly. 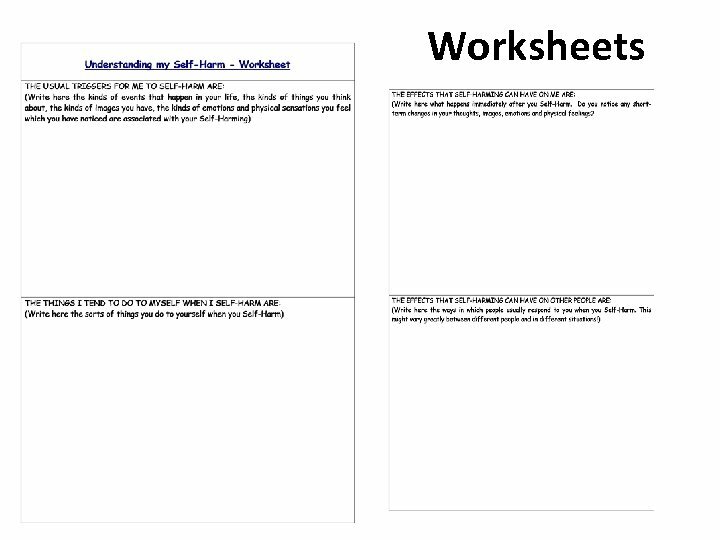 Worksheets Feelings Worksheet http: //www. stem 4. org. 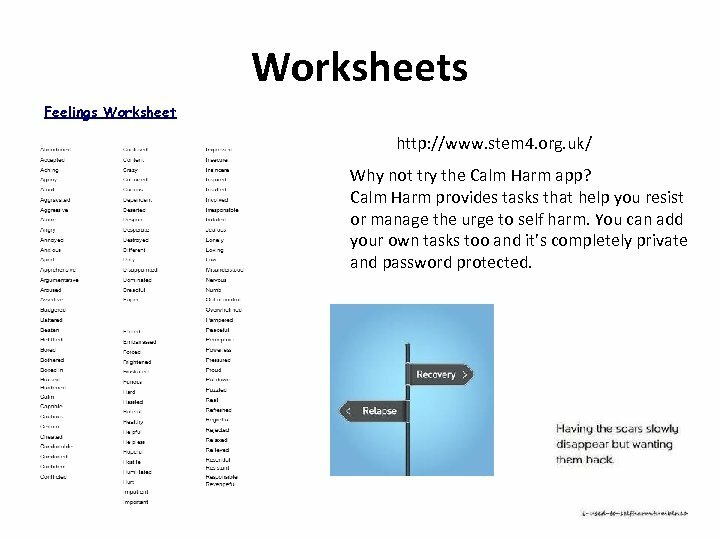 uk/ Why not try the Calm Harm app? 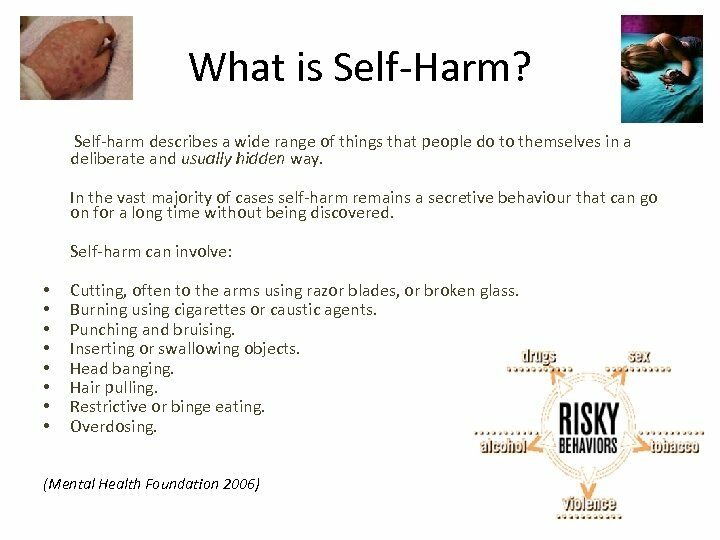 Calm Harm provides tasks that help you resist or manage the urge to self harm. You can add your own tasks too and it’s completely private and password protected. 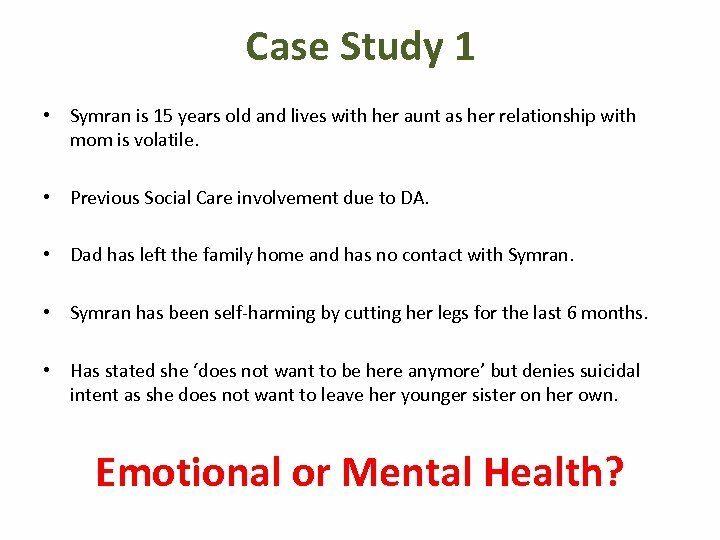 Case Study 1 • Symran is 15 years old and lives with her aunt as her relationship with mom is volatile. • Previous Social Care involvement due to DA. • Dad has left the family home and has no contact with Symran. • Symran has been self-harming by cutting her legs for the last 6 months. • Has stated she ‘does not want to be here anymore’ but denies suicidal intent as she does not want to leave her younger sister on her own. 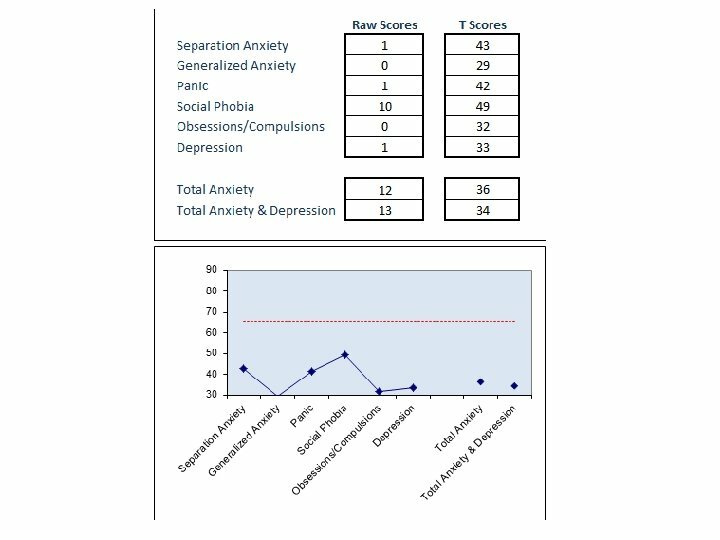 Emotional or Mental Health? • Symran’s relationship with mom is stressful and argumentative but not physically violent. • Symran wanted to live with her aunt but did not want to be separated from her sister who is with mom. • She does not worry about her sister’s safety, she misses her company. • Dad was the perpetrator of the domestic abuse and although she witnessed his physical attacks on her mom, she misses him and would like contact. • Symran started cutting herself when dad left and she feels that it provides a release from overwhelming emotions. 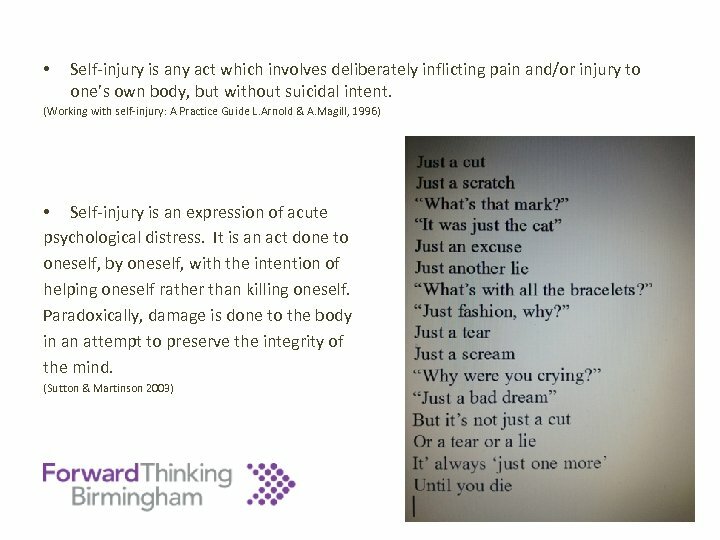 • Symran recognises that ‘not wanting to be here’ is an indication that her emotions are at a level where her self-harming is no longer effective and that she would like some support. 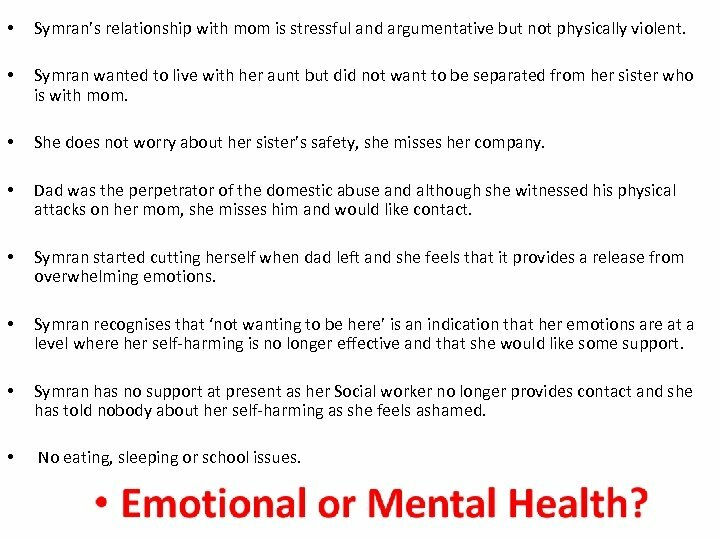 • Symran has no support at present as her Social worker no longer provides contact and she has told nobody about her self-harming as she feels ashamed. • No eating, sleeping or school issues. Emotional: Symran has a complicated home situation which is causing her distress. She has witnessed domestic abuse between her parents. She has lost her dad and the support she received from her Social Worker. Her issues are apparent only at home, she is achieving academically at school. 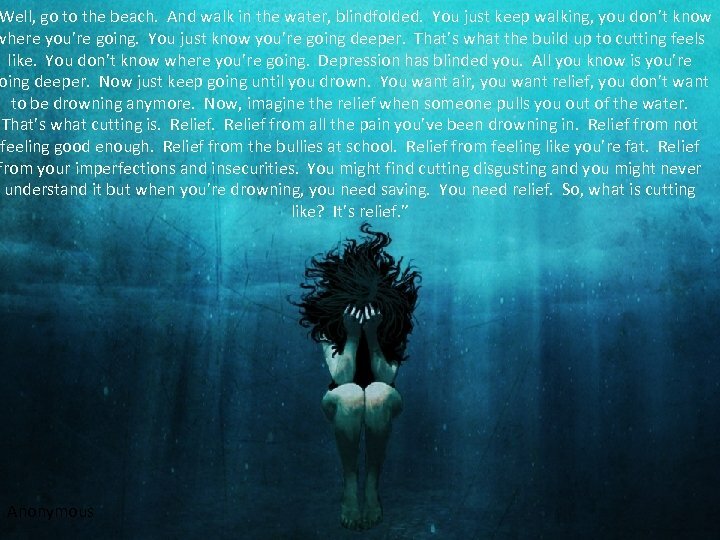 She states she does not want to die but that she finds her situation overwhelming. • She has no sleeping or eating issues. • She has friends but does not choose to confide in them. • She wants to have professional/confidential support. • • • Action: • A safety plan was agreed between Symran, mom, aunt and school and Symran agreed to alert identified people should her mood begin to sink. 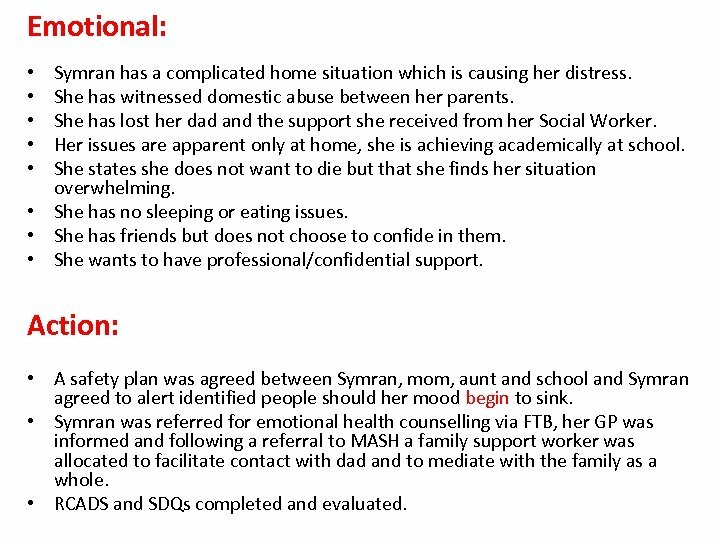 • Symran was referred for emotional health counselling via FTB, her GP was informed and following a referral to MASH a family support worker was allocated to facilitate contact with dad and to mediate with the family as a whole. 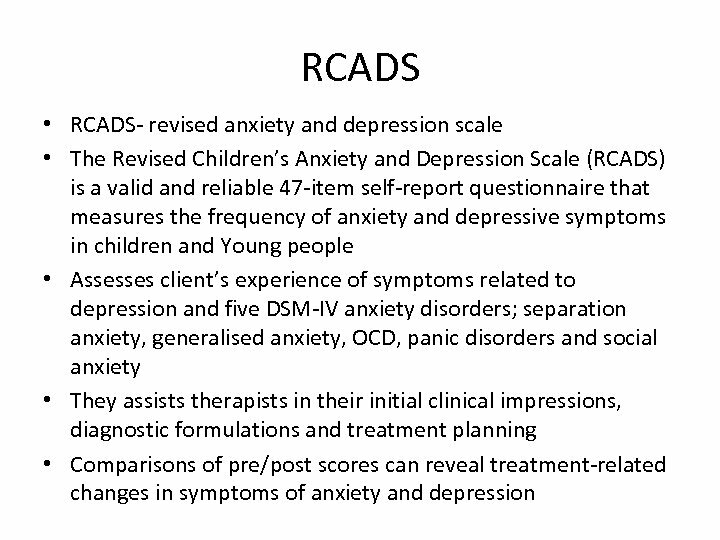 • RCADS and SDQs completed and evaluated. 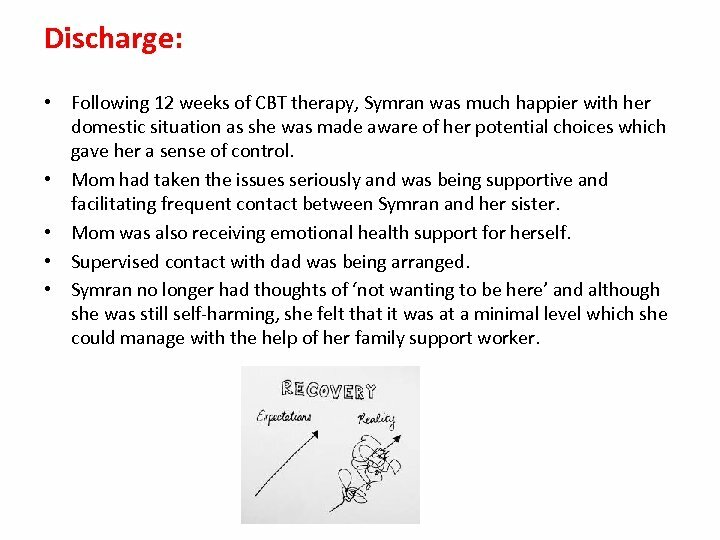 Discharge: • Following 12 weeks of CBT therapy, Symran was much happier with her domestic situation as she was made aware of her potential choices which gave her a sense of control. • Mom had taken the issues seriously and was being supportive and facilitating frequent contact between Symran and her sister. • Mom was also receiving emotional health support for herself. • Supervised contact with dad was being arranged. 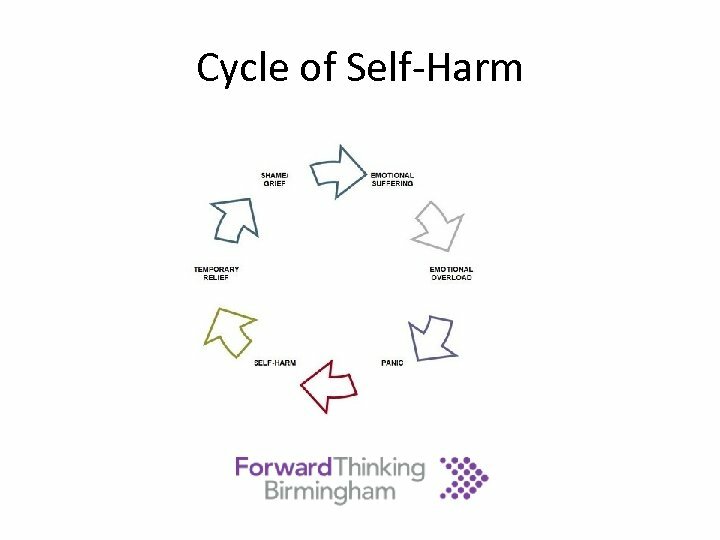 • Symran no longer had thoughts of ‘not wanting to be here’ and although she was still self-harming, she felt that it was at a minimal level which she could manage with the help of her family support worker. 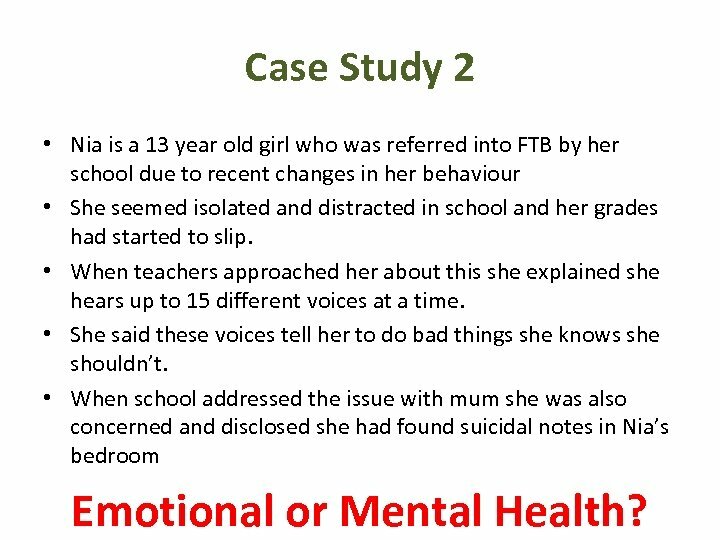 Case Study 2 • Nia is a 13 year old girl who was referred into FTB by her school due to recent changes in her behaviour • She seemed isolated and distracted in school and her grades had started to slip. • When teachers approached her about this she explained she hears up to 15 different voices at a time. • She said these voices tell her to do bad things she knows she shouldn’t. 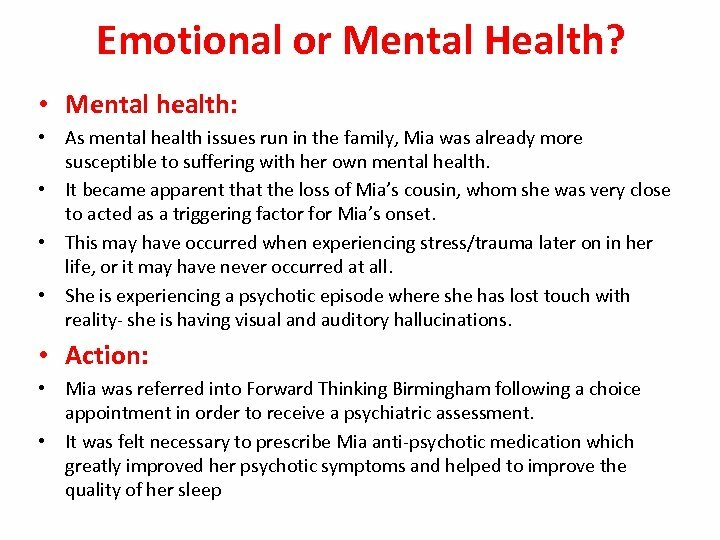 • When school addressed the issue with mum she was also concerned and disclosed she had found suicidal notes in Nia’s bedroom Emotional or Mental Health? 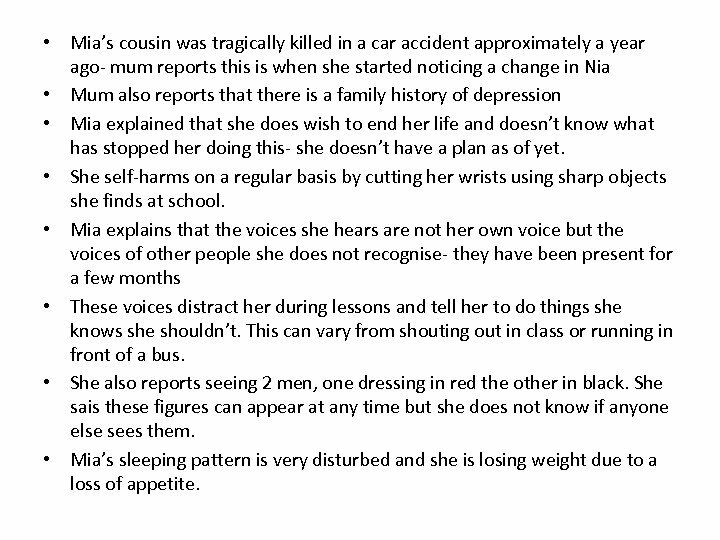 • Mia’s cousin was tragically killed in a car accident approximately a year ago- mum reports this is when she started noticing a change in Nia • Mum also reports that there is a family history of depression • Mia explained that she does wish to end her life and doesn’t know what has stopped her doing this- she doesn’t have a plan as of yet. 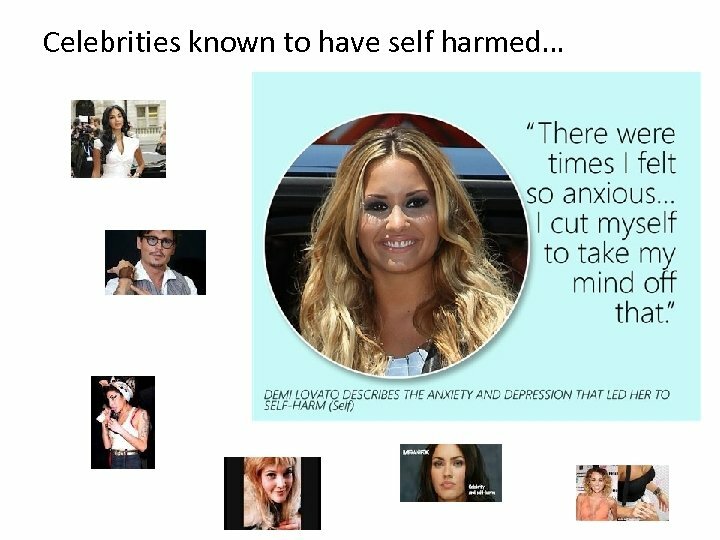 • She self-harms on a regular basis by cutting her wrists using sharp objects she finds at school. 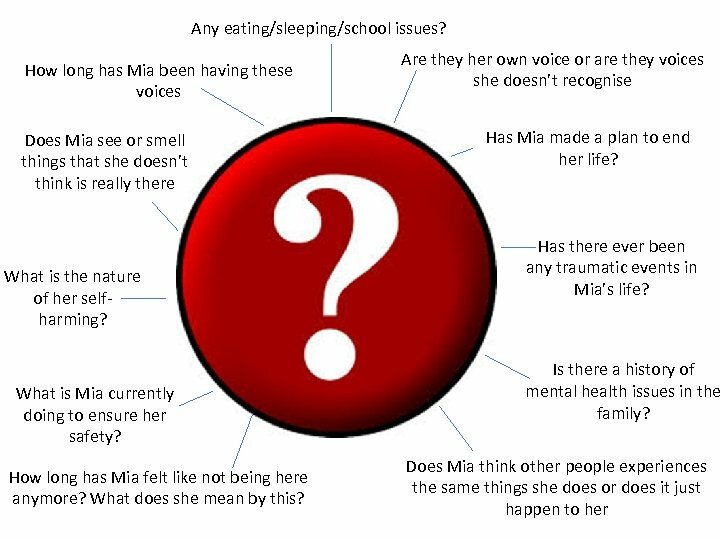 • Mia explains that the voices she hears are not her own voice but the voices of other people she does not recognise- they have been present for a few months • These voices distract her during lessons and tell her to do things she knows she shouldn’t. This can vary from shouting out in class or running in front of a bus. • She also reports seeing 2 men, one dressing in red the other in black. She sais these figures can appear at any time but she does not know if anyone else sees them. • Mia’s sleeping pattern is very disturbed and she is losing weight due to a loss of appetite. 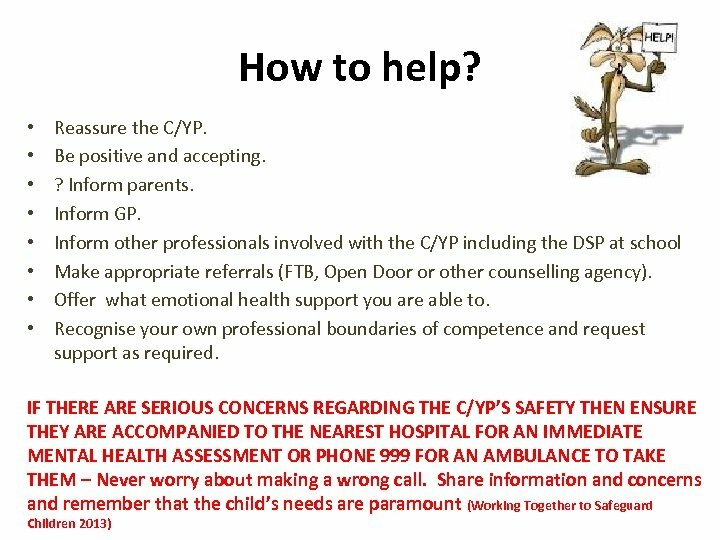 Learning Points: • Universal input is not for an emergency response, advise re 999, GP, A&E, parents. • Ensure the most appropriate person makes referrals/offers support. 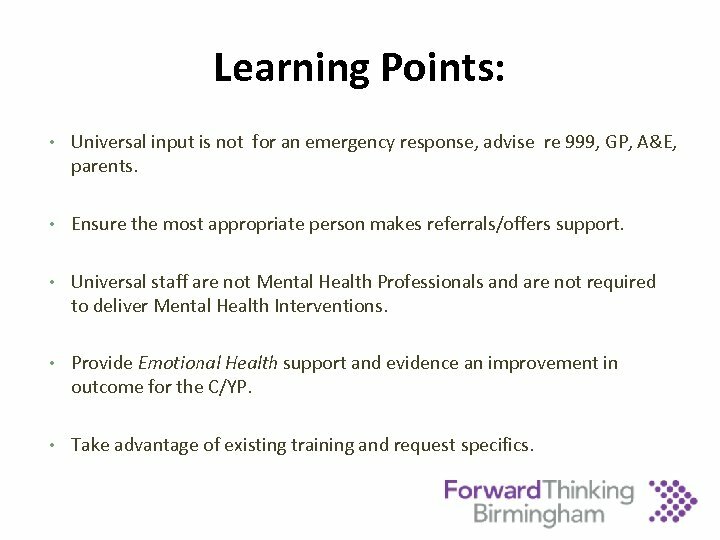 • Universal staff are not Mental Health Professionals and are not required to deliver Mental Health Interventions. 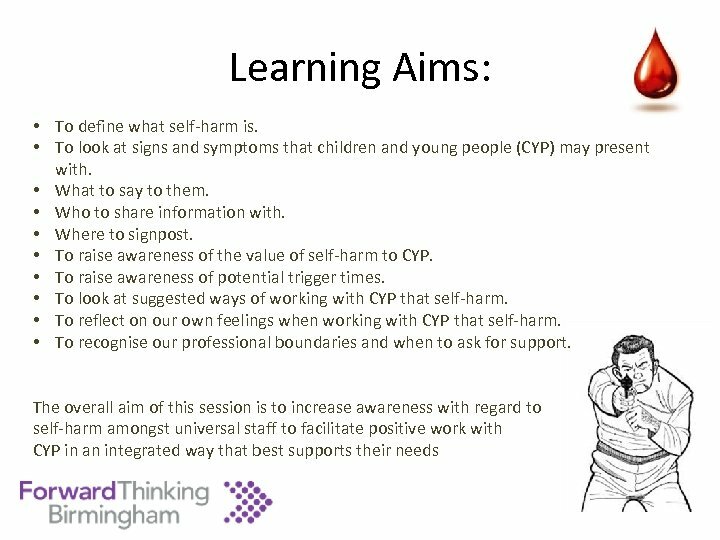 • Provide Emotional Health support and evidence an improvement in outcome for the C/YP. • Take advantage of existing training and request specifics.